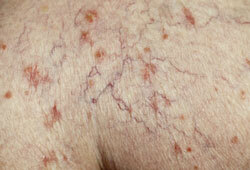 Spider veins are very small varicose veins and telangiectasias. They are thin, threadlike veins that lie close to the skin’s surface and are commonly red or purple in appearance. These dilated vessels may be short, unconnected lines, or connected in a matted "sunburst" pattern. They may also appear web-like or like branches from a tree. Spider veins are most frequently found on the legs and face, but could be found anywhere on the body. Generally they are not considered a health hazard, but patients may experience a burning, stinging or dull aching pain after prolonged standing. Some of the most common causes of spider veins include: a genetic predisposition, pregnancy, hormonal changes, oral contraception, trauma, weight gain, and prolonged standing. Laser technology offers a very effective means of treating spider veins. When a laser is applied to the skin, these blood cells become very hot and create a clotting effect, which collapses or closes the vein, while sparing the surrounding skin. The body will then slowly remove the collapsed veins during the natural healing process, and thus reduce the appearance of the spider veins. Each individual patient is different, depending upon the number and severity of the veins. Generally patients should expect between 1 and 3 laser treatments, about 6-8 weeks apart. The treatment improves the overall appearance of the blood vessels, shrinking, diminishing or removing them completely. Laser treatment for veins should not be considered a cure. New developing veins cannot be prevented. Soon after the procedure, you may feel a slight bump on the skin, which will disappear in the next 2-4 hours. The area may also appear slightly redder and occasionally may swell or bruise. Infrequently pigment changes occur (darkening of the skin), and will disappear and return to normal over time. After laser therapy, it is strongly recommended to stay out of direct sun exposure for a week or two. Wearing support hose can facilitate results. When can I return to work after laser therapy? After treatment, there is no down time and very little discomfort. Patients are encouraged to resume all normal activities immediately. Final results may not be apparent for several weeks. Most patients are satisfied by the results in a very short time.